As of April 2018, this site is no longer being updated. I have a new website at ljknightart.com, where you can find information about my colouring books and other projects. Read more here. 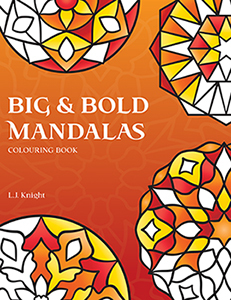 UPDATE – JUNE 2018: A second edition of Big & Bold Mandalas has now been published, and this first edition is no longer available. To buy the new edition, or to learn more about the book, visit Amazon.com / Amazon.co.uk or search for 1721027033 on your local Amazon site. You can also buy a digital version from Etsy here. Please note that the author name and back matter have changed, but the designs are still the same. To see previews of all the illustrations, visit the book’s page on my new website here. ©Copyright 2018 Tigerlynx.com. All rights reserved.